BLOG POSTS | Renew The Church! - website and Blog | All are called to holiness and the perfection of charity. You may have noticed, I’m writing fewer blog essays these days. The reason is NOT because I’m peacefully occupied elsewhere! The truth is, I am struck almost wordless, I strain with difficulty speaking of it, so incredible are these times! I stand and watch, hardly able to believe what I see and hear in front of me. It is as though the half of the world has gone mad – has lost all sense, all reason, making up “reality” as it chooses, as it wishes, as it wants. Life has become a parody of a game, “Virtual Reality.” But there is no comic relief in this insanity: there is only a fearsome obsession in zealous protagonists of their “new reality” – and the lusts for it will be satisfied, no matter the cost. The culture of America today is one infused with citizens of both Cities. Citizens of the City of Man are in the streets and are in the Church, in the Bowery and on Wall Street, in the government and in the prisons, in the monasteries and in the brothels – and so also are the people called into and belonging in the City of God! They are called into God and His City; some know it and some do not – yet. Some are lost and still blind, some are only barely seeing, some are crying in hunger, and some are feeding the hungry, their brothers and sisters, growing strong for the trials of the days to come. I’m looking for parish invitations! I want to pass on to those who are hungry, the precious Truth wrapped in God’s call. We have been given, in Baptism, a share in His very Life – and that Life, given in potency as it is, even to a precious infant, is intended to live, to grow, to develop all the way to maturity. His life is given with the potency of personal sanctity, the supernatural power to enable a communion with Him, a communion in His divine and eternal love. There is a trustworthy path to that goal of maturity. The Church has brought forth, by God’s grace, many holy saints. 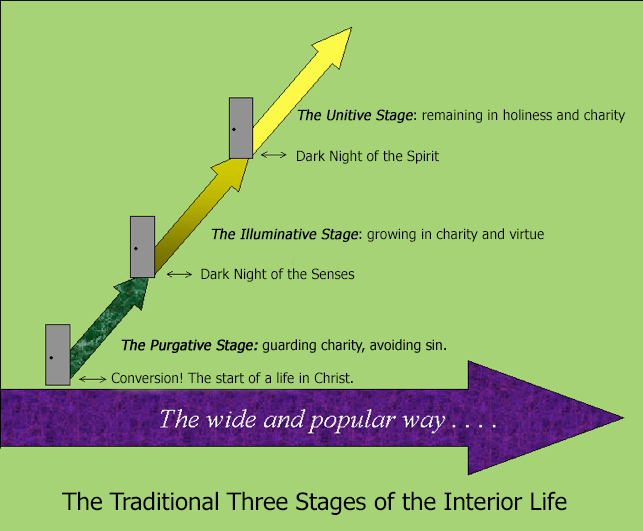 Their experience, and their witness, together coalesce into a spiritual theology of ascending the stairway of holiness. There is an “Ordinary Path to Holiness”; in the perfect prayer given to us by Jesus, there is an “Interior Liturgy of the Our Father” that maps for us the way of prayer-journeying to Him. He wants us to grow, to ascend, to complete His intention for us from the beginning. I’m looking for places to speak and to present these truths; I pray the Lord to open doors for this; please pray and seek with me. Please pray with me for a true, real, authentic renewal of the Church! Renew the Church! I’ve added a page to this website – Presenters and Presentations…. It is listed and linked on every page of the website, in the right-hand column of links, in the “Pages” Menu – “LOOKING FOR — Presenters and Presentations?” If you agree that we need, in the Church, this sort of catechesis – share this blog essay, and this link. Maybe they can be part of the opening of doors, to begin to bring substantive adult formation into our parishes and dioceses. We have been fed too little for too long. The times – and our Lord! – are calling for much, much more. The painful, ugly corruption in the Catholic Church that is erupting first here then there, in dioceses all around the world it seems, is a horror unthinkable to faithful Catholics. This Church is of God! His Spirit is the life of this Church! How has such blasphemous sin crept in, and found hiding places – and taken root – in parishes, in bishops’ residences, in chanceries and dioceses! How has the impossible and unbelievable come in so deep and spread so far and reached so high in this Church? And the question pierces me, and challenges me, what can we laity do? We cannot do nothing but wait for the institution – the corporation – whatever to call it, to heal and reform itself! Who can be trusted or believed? Who is not part of the problem? Who is not a mere hired man, careerist, clericalist, robber and abuser or enabler by self-blinded design who is a counterfeit in a charade, passing himself off for what he is not – a deacon, or priest, or bishop of the Church of the People of God? Who is really, truly, a shepherd of God’s sheep? Who can be believed and trusted, and who cannot? I don’t know how we can work to correct the mess at the parish or diocesan level – laity can’t institute parish- or diocesan-wide reforms in catechesis, in spiritual formation, in liturgies or in worship: only clergy can do that and many, it seems, are content with business-as-usual, with themselves in charge, thank you anyway. We, the laity, can work to correct the mess in our own lives, in our own minds and hearts; we can seek out and root out the corruption and love of sin in ourselves. We can listen to and hear and pray for the grace to believe the holy and saving Gospel. We can meet in homes, when the parish doors are shut to us, we can gather for ourselves materials that edify, when the parish programs are pablum and shallow motivational speakers, we can learn to pray from the masters of prayer the saints, when the canned programs bought by the office are insults to the wisdom of the saints, more mere pandering of opinions, empty of substance and power. We the laity can ask and seek and knock where the Spirit is, and we can see and hear and receive, and grow in, His holy Truth. In the last blog essay, I tried to introduce again my first book, The Ordinary Path to Holiness. That book was written to help ordinary Catholics learn of, and understand, the path that a seeking, hungry soul travels, on the path to God, to holiness and peace in Him. 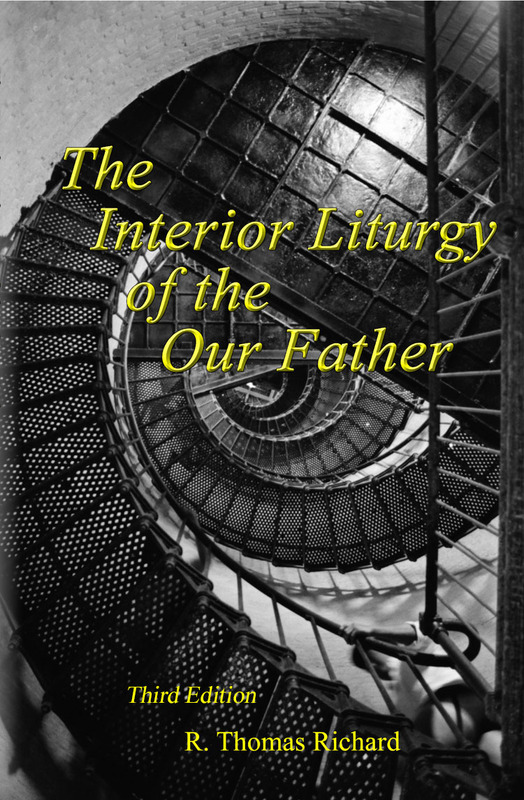 In this blog essay, I will introduce again my second book – which follows the first in several ways – The Interior Liturgy of the Our Father. This book, like the first, is about prayer and the life of prayer. May the beautiful and powerful wisdom of the saints of the Church – the masters of prayer – find root in some: in you the reader. Thereby, our holy Church will be healed and reformed, one precious soul at a time. And that would be a beautiful work among us for our Lord. St. Teresa of Avila is a very important, significant spiritual teacher for Catholics seeking a deeper interior life – a life of prayer-communion with God. The Father blessed her with a full experience of prayer, a full experience of the entire journey of prayer from the very beginnings of prayer, to the highest summit of prayer possible on this earth, just short of the beatific vision in heaven. Should it surprise us, then, that the journey of prayer discovered and experienced by St. Teresa of Avila “lines up” in a very meaningful, beautiful and helpful way, with the journey of prayer that Jesus gave us in His gift of the prayer, “the Our Father”? The Interior Castle of St. Teresa describes her life-experience of prayer, and passes on for us, her wisdom – thank you, St. Teresa! The prayer, “the Our Father” – brief and simple as it is – is the gift of God to us to not only help us pray, but to show us the journey of prayer. The Our Father shows us the sequence of steps or stages that we walk, when we walk the journey of prayer. Thank you, Lord Jesus! The parallels linking Teresa’s “Interior Castle” and the petitions of the Our Father are first described in Ch. 5 of the book, The Ordinary Path to Holiness. The realities of that chapter continued to deepen and unfold in me, until they came together into a statement all their own: The Interior Liturgy of the Our Father. Those who have read The Ordinary Path will be led deeper into this traditional Catholic path to holiness in the divinely-given prayer, the Our Father. I will briefly describe the book, chapter by chapter – perhaps it will interest and invite you to “come and see”. This observation leads us to understand the journey of prayer itself: how we are led in prayer (in this prayer) to ever-closer communion with our Father, from the very beginnings of prayer, to the highest heights of union with Him and in Him. Here, we listen carefully to the prayer, petition by petition. Here, we see the significance of the word “liturgy” in the prayer, as each petition points us to a corresponding sacrament in the Church. Chapter 4. The Our Father and Teresa’s Interior Castle. Here, the parallel is seen, between the Interior Castle of St. Teresa (and the journey of prayer that it reveals), and The Interior Liturgy of the Our Father (and the journey of prayer that it reveals). We find one journey, described in the prayer, and experienced by the saint. Chapter 6. Conversion: The First Movement of the Mass, and of the Interior Liturgy. The petitions of the Our Father that are included in this first movement, and the grades of prayer associated with them. Chapter 7. Consecration: The Second Movement of the Mass, and of the Interior Liturgy. The petitions of the Our Father that are included in this movement, and the grades of prayer associated with them. Mary in this work of the liturgy. Chapter 8. Communion: The Third Movement of the Mass, and of the Interior Liturgy. The petitions of the Our Father that are included in this movement, and the grades of prayer associated with them. Mary and Peter together. The natural life of mankind, the supernatural, spiritual life of mankind, the pattern of Christ making His disciples. God’s work in us in three movements of Holy Liturgy. Woe to the shepherds of Israel who have been pasturing themselves! So they were scattered for the lack of a shepherd,and became food for all the wild beasts. This Responsorial Psalm for today is beautiful. The “Good Shepherd Psalm” reminds us: “The Lord is My Shepherd” . Jesus is The Shepherd who looks after and tends His Sheep. He calls His Church, Clergy and People, to follow Him – as Mary, His mother and our Mother did on this earth. Today’s Gospel (from Mt. 20:1 – 16) is an encouragement for all. Whether we opened ourselves to God’s Grace early in our lives or late, it is finishing the race well that is most important. While we have time, let us “Behold our Mother” as Jesus told us from His Cross. Today let us listen to Him, as Mary pondered His Word and as she told the servants of Cana: “Do whatever He tells you”. Humility is essential if we want to hear truly! “…in order to empty ourselves of self, we must die daily to ourselves. This involves our renouncing what the powers of the soul and the senses of the body incline us to do. We must see as if we did not see, hear as if we did not hear, and use the things of this world as if we did not use them. This is what St. Paul calls “dying daily”. Kindle in us, the Fire of Your Love. Mary, Queen of the Clergy, Queen of Families, pray for us. In May of 2015 I met Gregory Wietrzychowski, a painter, a pilgrim, a devoted son of our Blessed Mother Mary, who was on an extended pilgrimage around the U.S. to Marian Shrines, in prayers of reparation for sin. I wrote a blog essay on him and his work HERE. Gregory since completed that pilgrimage, and I’ve heard from him that he started another! He brought me up-to-date with his work of prayer, and he included some experiences near the close of the first journey. I asked Gregory if I could publish his words to bring up-to-date a bit, some of you who have expressed interest in his work of prayer. We did change one name in his account, but all else is as he experienced it. I am glad you and Deborah are doing well. I did finish the Pilgrimage in Alexandra, Louisiana in end of November on 2016 so just a bit over two years. I went back to Clear Creek Monastery in Oklahoma to work on duplicating a painting from the 1400’s by Jan Van Eyck one of his panels from the Ghent Alter Piece in Belgium. I have been working on it for about a year and a half since I finished the Pilgrimage. I am about two thirds done right now. For the summer I went to San Francisco to start another Marian Pilgrimage from St. Anne’s church where there is a Shrine to St. Anne to the Cathedral of the Immaculate Conception in Portland, Oregon with the hopes to meet Archbishop Sample. I made it up to Crescent City, Ca where a Priest Fr. Greg from St. Joseph’s church invited me to pitch my tent in his backyard. I woke up at 1am and a few minutes later I had a heart attack and went to the Hospital in Crescent City. Then I went to the Airport and was flown to Eureka, CA. by ambulance plane and taken to St. Joseph’s Hospital where I had emergency surgery to put a stent in to stop the heart attack. Now I am recovering at a place for now three weeks and in another week and a half I will be going back to Oklahoma by train thanks to my friends at Catholic Charities in Tulsa, Oklahoma. Then I will go back to Clear Creek Monastery to finish the painting for Father Abbot Anderson. So the recovery is going good a lot of resting and praying. I am meeting people that I would have not met if not for the heart attack and I am offering them up to the Immaculate Heart of Mary for Her intercession for their conversions into the Catholic Church. I was fortunate to be aware of what was happening during the heart attack and offered the sufferings up for those people in both emergency rooms and the flight nurses to again the Immaculate Heart of Mary for their conversions into the Catholic Church. So at this facility where I am recovering I came across your blog Thomas and saw the article on my pilgrimage which thank you so much for that and I saw no contact so I just left that small comment. I have been asked many times to write a book on the events that happened on the Pilgrimage to inspire a deeper devotion to Our Lady and the miracles that come with those devotions when we put all our trust with Her. I will attempt to tell you what happened after you and your wife suggested the two places to go visit on the Pilgrimage I was walking in 2015 which was the first of what would take just over two years to finish. After you dropped me off on the highway I walked the rest of the day. I then pitched my tent in wooded area next to the highway at sunset. The next day I was walking carrying my backpack and frontal bag in prayer in the morning. It was sunny and very hot and humid the temperature was due to be in the high 90’s for the day with an index of 105 degrees. There were no trees on the highway and the patchy clouds would occasionally shade the hot sun cooling the air for a few minutes. I was running out of water in my gallon jug which had a little bit of stale water from the day before when I came across an old chapel. I went back on the divided highway praying the Hail Mary prayers as I walked. When I was approaching a bridge that crossed a river with a two mile delta after the bridge. We crossed this very wide highway, met at the center of the divided highway where this man gave me an ice cold bottle of water. It was quite a relief, I thanked the man and offered him up to the Immaculate Heart of Mary in a prayer as we parted ways, thanking God for this little miracle. I cherished this bottle of water during my walk in the heat of the afternoon when it came to the time it went empty. I went the rest of the afternoon without water. In early evening I was at a road crossing on the highway standing on the shoulder asking Our Holy Mother where can I find some water when a moment later these little sprinklers popped out of the ground on this private property adjacent to the shoulder. I got my empty gallon jug and filled it with water. I smelled the water in the jug which had a sulphur smell but it was drinkable. The next day was a Sunday, it was just as hot as the day before but there were more puffy clouds in the sky to more frequent shade. With it being Sunday I was not able to go to Holy Mass. During my walk in prayer praying the Rosary making stops when I felt heat radiating from my skin allowing to cool down to avoid heat stroke. I was walking along the shoulder when a Black Cadillac Escalade SUV pulled up on the shoulder ahead of me. It stopped for a moment then pulled out on to the near lane and turned on a dirt ranch road kicking up dust turned around came up to the highway where it waited patiently to walk up to it. Now mind you I was going to Mepkin Abbey as my next destination Shrine to Our Lady. The man asked where I was going and I told him Charleston. The man replied he was going that direction as he got out of the SUV to open the back to put my backpack in. I saw some golf bags with clubs also in the back. The man said he was coming back from a weekend golfing trip with some friends. I hopped from the humid 90 degree heat into the Cadillac Escalade, it was like heaven. There was air conditioning and air conditioned seats with accordion shock absorption under the seats which made it feel you where sitting on a cloud. I introduced myself to the man and told him I was on a pilgrimage walking in a figure eight across the country going to 150 Catholic Shrines dedicated to the Blessed Virgin Mary. I was amazed at what Rodger said to me! Then the phone rang and it was his mother. They were on the phone for sometime. When Rodger was done he told me we were approaching Charleston asking where I would like to be dropped off. I told him the nearest Catholic Church. I looked at Rodger in shock because it was like he read my mind and it came out of the blue. I told Rodger that Mepkin Abbey was my intended destination, as a Shrine to the Blessed Virgin Mary. Rodger then turned up another highway and we stopped at a grocery store where he bought me all this food. Again I said that is my next destination after Mepkin Abbey. Rodger told me he is directing his family’s funeral home for his mother since his father passed away. We arrived at the gate at Mepkin Abbey, it was closed and it was getting dark. Rodger got out of the Cadillac SUV and helped me with my bags then gave me a very generous donation with his business card. We parted ways and I went into the nearby woods and pitched my tent thanking Our Lady for the amazing events that had just occurred. The next day when the guest house opened I told the Guest Master, a lay person, that I was on a walking pilgrimage to 150 Catholic Shrines dedicated to Mary, if there would be any type of accommodation he could offer? The man told be they were full but to wait in the Chapel because there was a possibility of a cancelation. I went ahead into the Chapel. There I prayed the Rosary, when half through the Rosary the man enters the Chapel telling me there was a cancelation and I could stay for three nights. It was such a beautiful Monastery, the monks were very nice and the food very good. The silence was excellent where I prayed my Reparation Prayers to the Sacred Heart of Jesus and the Immaculate Heart of Mary. I do this at each Marian Shrine I visited on the Pilgrimage. After I spent three days at Mepkin Abbey I started my next walk to Kingstree in prayer. When I walk I pray the Our Father, Hail Mary and the Glory Be not in that order and I change the prayers as I walk and meditate. I pray the Rosary. I also pray the daily Office, Terce, Sext, None and Vespers from the books I bought at Clear Creek Monastery. I just kneel on one knee on the side of the shoulder off the highway and pray the Office. So on the third day of the pilgrimage from Mepkin Abbey to the Shrine of Our Lady of Joy in Kingstree, I was offered a ride about ten miles from a very nice man who dropped me off in Kingstree. I then pitched my tent next to the Shrine and in the morning I put my tent away. I looked and saw the funeral home of Rodger’s family friend. There was a car in the parking lot and a hearse parked next to the main entrance. I went to a large statue of Our Blessed Mother in the backyard to pray my morning devotion to Her. I then prayed this very long of Litany of Saints with about two hundred Saints in the Litany. As I prayed this Litany of Saints about half way through I was approached by a woman who was the assistant to the Priest Fr. Stan. She introduced me to Fr. Stan, a wonderful Catholic Priest and an expert on Marian Shrines. We had Holy Mass then Fr. Stan took me and his assistant to a restaurant where we chatted and I told some of the wonderful experiences and miracles I had witnessed on this very special pilgrimage and adventure with Our Holy Mother. So later I asked Fr. Stan if he could touch a cloth to all the first class relics he had out in the Church. Fr. Stan touched the first class relics with the different pieces of cloth which then, the cloth turns into a 3rd class relic. Then Fr. Stan told me there was going to be a conference tomorrow morning for thirteen women that were coming there from a town fifty-five miles away. Fr. Stan told me I was more than welcome to take notes and then have Holy Mass. Fr. Stan such a wonderful Priest and his knowledge of Our Lady and also St. Joseph was truly special. He invited me to stay in his guest house overnight. The next morning I set up the tables in the community house next to the Chapel. Then the women arrived who were elderly and middle aged, and were really excited to hear Fr. Stan speak. So I sat through the conference in the back taking notes, listening intently, when at the end Fr. Stan said, “We have a man here this morning who is doing a walking pilgrimage in a figure eight across the whole country. Gregory !….Can you stand up and tell these women what happened to you when that man in the Cadillac Escalade picked you up in Jacksonboro! There was not a dry eye in the room including Fr. Stan. Our Lady of Joy filled that room of her Shrine so full of Joy it was impossible to not cry with the joy ! Truly a miracle ! This was just a small portion of other miracles that had happen on the pilgrimage and it was also an adventure with Our Lady in prayer and in abandonment to Her as a child to Mother in total trust.